This research is producing innovative concepts, supplemented with experimental data, to enable lean direction injection or LDI combustion for next generation aviation gas turbines to meet stringent emissions, noise, and efficiency goals established by NASA and regulation agencies. The LDI combustion is prone to thermoacoustic instabilities or large-amplitude pressure oscillation that can severely damage the engine. The UA team has developed and patented a porous insert concept to address these problems. We are exploring methods to create highly functional porous inserts from aviation grade materials using 3D additive manufacturing techniques. NASA’s in-house experience is being utilized to define the hardware and operational challenges for the present study. This research seeks t​o develop and validate accurate, physics-based, numerical submodels and framework, which can be implemented in CFD software to enable it to accurately predict high-pressure diesel spray. The combined experimental-computational effort consists of (1) acquiring spatially and temporally resolved scalar measurements of fuel-oxidizer mixing in the near field of the jet for a range of supercritical or nearly supercritical test conditions relevant to diesel engines, (2) developing real-fluid model and code to calculate thermo-physical properties of diesel surrogates and their mixtures with oxidizer of interest at a wide range of operating conditions, especially at pressures near and above the critical conditions. This research seeks to characterize the flow at the discharge of a Rotating Detonation Engine (RDE) using time-resolve particle image velocimetry (PIV), OH chemiluminescence, and/or OH PLIF techniques at approximately 20 kHz. The RDE will be operated with methane fuel and oxygen-enriched air to replicate conditions relevant to power generating gas turbines. Flow measurements will be acquired between rotating shocks and at radial locations corresponding to inner and outer walls of RDE combustor. We are interested in time-resolved measurements of flow velocities, selected combustion species, dynamic pressure and temperature. The test rig shall provide a back pressure to the RDE combustor up to the safe operating limits of the facility. Our research group has conducted several studies to demonstrate the favorable spray and low-emission combustion characteristics of FB atomizer using conventional fuels and alternative fuels including biodiesel, straight VOs, waste byproducts, and glycerol. ​of FB atomization. Liquid fuel is supplied through the central fuel tube, and atomizing air is supplied through the outer tube surrounding the fuel tube. Upstream of the exit orifice is a small gap between the orifice inlet and fuel tube exit that allows the atomizing air to mix with the liquid fuel before exiting through the orifice. In FB atomization, the gap designated by H must be less 0.25 D, where D is the fuel tube inside diameter. H/D ≤ 0.25 results in radial flow of the atomizing air across the gap H, and a stagnation region is formed in the gap. Thus, the atomizing air is bifurcated with a portion of the air flowing into the fuel-tube and the rest being directed towards the exit-orifice of the FB injector. 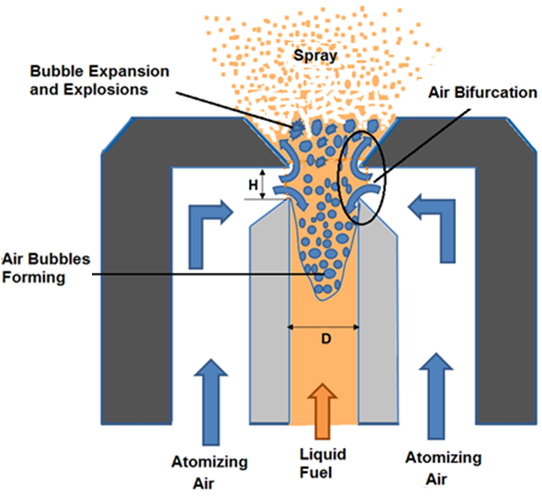 While most of the atomizing air exits through the orifice, a small portion penetrating upstream forms bubbles and mixes turbulently with the incoming fuel. The two-phase mixture with small air bubbles, then leaves the orifice forming a fine spray. The rapid bursting of air bubbles as they experience sudden pressure drop across the orifice is the mechanism for FB primary atomization that results in a spray with fine droplets even for high-viscosity liquids.